MMv4: Changes to Admin Home Page..
MMv4 introduces many improvements and new features to the Admin Home Page. This page is the first page you see when you log in to your store's administration area; it's your dashboard that gives an instant overview of your store's performance and attention items. The admin home page includes a link titled Organize this page. Clicking this link loads the page in "drag and drop" mode. Click the Organize this page link to organize the Admin Home page. In "drag and drop" mode, the different sections of the Admin Home page are outlined with a red box. Simply move your mouse over one of these sections, hold down the mouse button, and drag it to a new location on the page to move it. Dragging the Fulfillment Stats table to a new location. The new location will be saved automatically after you drag it. Each administrator may organize the Admin Home page their own way. When you've finished organizing the page, click the Done organizing this page link to return to the normal page view. The New Customers summary displays info on the number of new customers that have registered with your store today, this week, this month and this year. The graph displays both the number of new customer registrations and the number of orders placed by returning customers over the last month. The New Customers summary displays new and returning customer info. The number of outgoing email messages in the Email Queue is now displayed on the Admin Home page. The calendar isn't just for looking at anymore. Each day on the calendar is a link that will take you to a Daily Snapshot Report for that day. Find out what happened that day: how many orders were placed, how many new customers joined your store, how many emails were sent, the best selling products, what actions were taken by Admins, and much more! 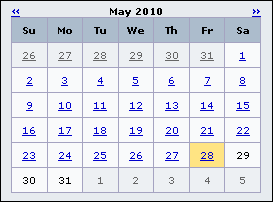 Go to a Daily Snapshot Report for any day directly from the calendar. The Whiteboard just got a lot more powerful. It's now powered by the same WYSIWYG editor used to manage templates, emails and custom web pages. 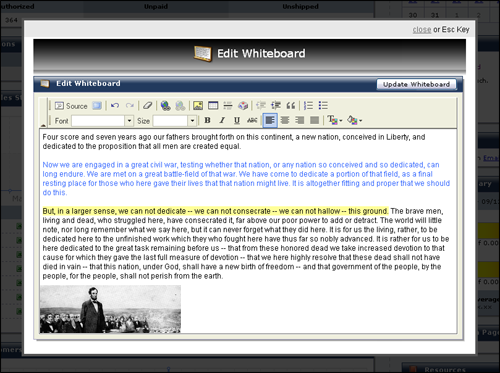 Add formatting, HTML and images to your whiteboard messages. Unleash the unrelenting power of the new WYSIWYG Whiteboard Editor. The Admin Home page now includes a handy-dandy list of the other administration pages you have recently viewed. This could easily be used as a list of bookmarks to the pages you visit most often. The date and time of the most recent logins by your admins is now included on the Admin Home page. It is very useful in keeping track of who's doing what, and when. Looking for help? We've added links directly to the most common help resources right on the Admin Home page. With just a click, go directly to either the knowledge base, instructional videos, QuickCode Tag glossary or Support Tickets. Find what you're looking for, and never look back. Previous to version 4, there were several different Admin Home pages. There was one for Super Admins, Tech Admins, Fulfillment Admins Call Center Admins and Manufacturer Admins. In MMv4, admins are no longer split into five different types. Instead, permission levels can be set independently for each admin. The admin-specific permissions levels also make the five different Admin Home pages obsolete too. So they've been removed. Multiple admin types are out. Multiple Admin Home pages are out. Simplicity is in.